As described by their name, “portable” table saws are a type of table saw - designed for easy lifting and moving, making them great for either carpenters or DIYers who spend most of their time on the job site moving from place to place. They mainly perform the same functions as larger table saws, but on a smaller scale - the large induction motors running on saws in other classes are replaced here with lightweight universal motors. This reduces the power while also making them a little louder than their larger counterparts. Amongst the compromises made for their portability, the cast iron top is often replaced with aluminum. These particularities derived from the portability benefit are not necessarily benefits themselves, as they increase vibration and reduce stability. However, they are not to be considered shortcomings: a portable table saw is one of the most valuable tools a woodworker can have. Whether you're just getting into carpentry and are looking for your first saw or looking to upgrade to a better model, you are in the right place. Keep in mind, though, that it is an investment - portability comes with a price, and these are not cheap tools. We'll start by exploring some reviews, and later on, we’ll be talking about table saw uses and how to choose the best portable table saw for your needs and budget. Ridgid is an American subsidiary of Emerson Electric specialized in power and hand tools. Ridgid power tools, also called Rugged Jobsite Tools, are widely known in the industry for their sturdiness and durability. They are used by professionals all around the world in all types of environments and extreme weather conditions. This producer strives to make user-friendly tools which improve efficiency. 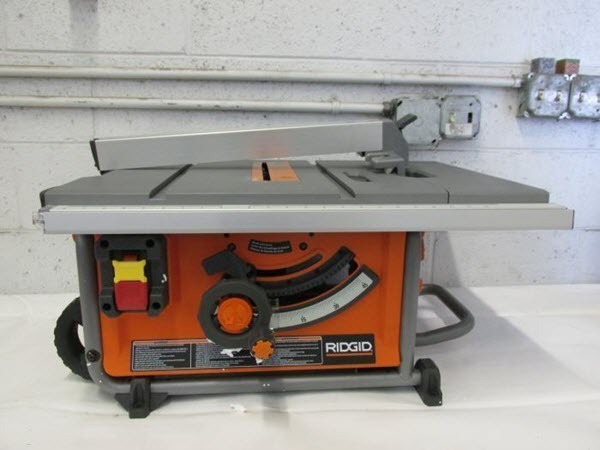 Let's take a look at Ridgid R4516 Portable table saw here. Measures: 31 x 25 x 15 inches; Power: 15 AMP; Top speed: 5000 RPM; Weighs 54.55 lbs. This table saw features an integrated riving knife/spreader which easily converts from spreader to riving knife in seconds for non-through cuts. The trademark slight blade guard modular barrier system will provide maximum user protection, while its onboard storage can hold the miter gauge, push stick, blade wrenches, and power cord neatly for efficient transportation. Also, features a two-in-one hand wheel for quick height and micro bevel adjustments. The retractable handle and 6 in. Solid wheels make for easy job site transportation. Comes with: table saw, a carbide-tipped blade, a tool-less blade guard, anti-kickback pawls, a rip fence, a miter gauge, blade wrenches and a push stick. 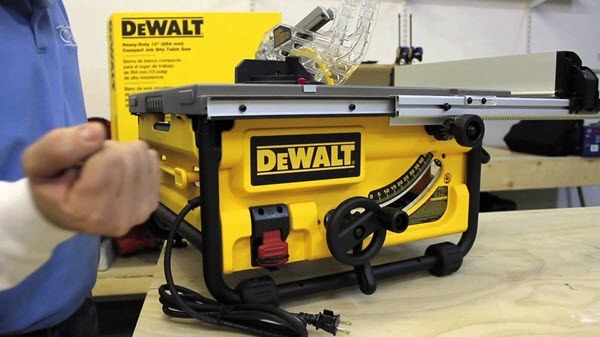 Surely you’ve heard of DeWalt the tool company, but what you probably didn’t know is that its founder, Raymond DeWalt, was the inventor of the radial arm saw. For over 90 years, this producer has been perfecting the saw in all its forms. Dewalt DW745 portable table saw is yet another top-notch tool from Dewalt, who are committed to providing user and environment-friendly tools for professionals and aficionados. Measures 25.75 inches x 26.5 inches; Weighs 53.25 lbs; Power: 15 AMP; Top Speed: 3,850 RPM. It's lightweight, and optimized footprint make this the most portable saw in its class. The steel roll cage protects the saw in case of drop or impact, while the rack and pinion fence system, front and rear fence lock and large and clear scales combine to give an extremely accurate and easy to use the saw. It features a fence system which provides 610 mm of rip capacity. Its cast table top design ensures accuracy and precision, while the overload protection system ensures powerful performance with hard, wet or frozen woods. The quick bevel lock with large scale ensures easy, accurate adjustments. Also features Trademark Site-Pro Modular Guarding System, Telescoping fence rails, Dust collection port for fast, clean up. Comes with: 10-inch 24-tooth carbide blades, miter gauge, push stick, blade guard. Whether you are familiar with power tools or not, you’ve surely heard of Bosch. The Robert Bosch Tool Corporation is a world leader in the design, manufacture, and sale of power tools, rotary and oscillating tools, accessories, laser and optical leveling and range finding tools, as well as garden and watering equipment. 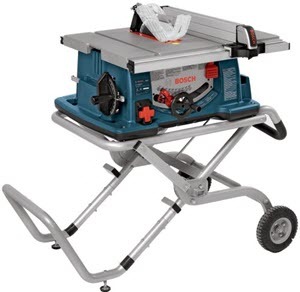 Let's take a look at Bosch 4100-09 portable table saw here. Dimensions: 30 x 20.9 inches; Weighs: 99 lbs; Power: 15 AMP; Top Speed: 3650 RPM. The Bosch 4100 brings new enhancements to the table that make the 4100-series a precise, durable and high-performing table saw. Introducing the first-ever modular smart guard system, also includes other innovations such as a super-durable sub-base with carry handles, Bosch trademark Square Lock Rip Fence with auxiliary fence slots, and a t-slot miter gauge. The Bosch modular smart guard system is a ground-breaking new design for portable table saws that includes a blade guard, riving knife, and anti-kickback pawls. All three elements are modular, so users can quickly and easily move them around independently based on the task. The blade guard is particularly user-friendly, featuring a new split-guarding innovation that offers an optimal line of sight and, thus, maximum protection. The riving knife prevents material from pinching the blade and offers positions for full upright, "splitting," and "non-through" cutting. For professional tools, durability is an essential value component. The 4100 also offers Constant Response Circuitry with Soft Start for smooth ramp up speed and to maintain speed under load. At 29 by 21-1/2-inches square, the table saw provides the most usable tabletop space available, with a 25-inch rip capacity that can easily handle sheet goods or larger pieces. Features an arbor lock system which makes blade changes quick and easy to do. On-board storage for accessories and the Smart Guard System makes moving easy between jobs. High-end quality deserves to be paid for, and the Dewalt DWE7491RS portable table saw will keep on paying you back for years on end. It’s not the cheapest on this list, but it has been known to be extremely damage-resistant and durable. Dimensions: 31 inches x 24.5 inches; Weighs: 110lbs; Power: 15 AMP; Top speed: 4800 RPM. While you may think it’s rather heavy, the rolling stand on this table saw is what makes it easily transportable. It features the Rack & Pinion Fence System which makes for fast, smooth and accurate adjustments, as the 32-1/2" Rip capacity helps to cut a variety of larger shelving easily and also to trim materials. Thanks to the 15 Amp motor, it will quickly rip through hardwoods with no difficulty. The rolling stand on this portable saw has been designed for easy setup and breakdown with excellent stability. Features an on-board storage system which provides easy access to the site, as well as store pro guard components and pushes stick when not in use. This saw offers 3-1/8 inch depth of cut at 90 degrees and 2-1/4 inch at 45 degrees. The 2-1/2-Inch Dust Collection Port easily connects to a vacuum for efficient dust extraction helping you to keep a clean workspace and air quality. The 26-1/4 inch X 22-inch table provides superior material support. WEN is an American power tool producer with an experience of over 60 years in the industry. Their goal is to provide affordable high-quality tools. Here’s what they’re bringing on with their 3720 table saw. Dimensions: 30 inches x 45 inches; Weighs: 85lbs; Power: 15 Amps; Top speed: 4400 RPM. This portable table saw can cut through boards up to 3-9/16 inches deep with a 26-inch ripping capacity. The blade can be beveled anywhere from 0 to 45 degrees to the left. Table extensions in either direction create additional space of up to 40 x 30-7/8 inches. Its onboard storage along with a 2-1/2 inch dust port maximize cleanliness and organization. This saw includes a reliable fence, a miter gauge, two 8-inch wheels and a rip stick. The rolling stand provides portability and precision to meet the needs of any contractor or DYIer. With just folding up the table saw onto its stand you can roll it to anywhere you want your workspace to be. Boasting an impressive 26-inch ripping capacity, it goes through boards up to 3-9/16 inches thick with ease. The motor power and speed make it easy work with even the hardest of woods. It also includes two table extensions to adjust both the length and width of the table's size, creating a space of up to 40 x 35-7/8 inches, to support even the largest pieces of wood. Plus, the reliable fence clings tightly to the table, perfectly parallel with the rotation of the blade for accurate cuts every time. This table saw also grants users maximum versatility in the way it cuts. The adjustment tracking knob located on the front side of the saw's body allows woodworkers to change both the height and angle of the blade easily. Bevel the blade anywhere from 0 to 45 degrees to the left while still maintaining a respectable cutting capacity of 2-1/2 inches. And, depending on the needs of your project, you can always swap out the included blade for a dado head to help create strong joints in your workpieces. Aside from a reliable and compact table saw, this package also includes a miter gauge for cutting along angles, a rip stick to maximize safety and a sturdy fence to guide boards in a straight line. It also has two table extensions to increase your workspace in either direction, two eight-inch never-flat wheels, adjustment wrenches, a 2-1/2-inch dust port to minimize cleanup, onboard storage for simple organization and a two-year warranty. What better way to finish up our list than with another world-class quality saw from Dewalt, one of the most trusted brands in the market? 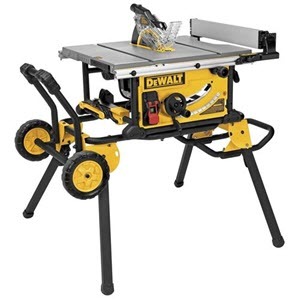 The Dewalt DWE7480XA is one of the best portable table saws available in the market right now. 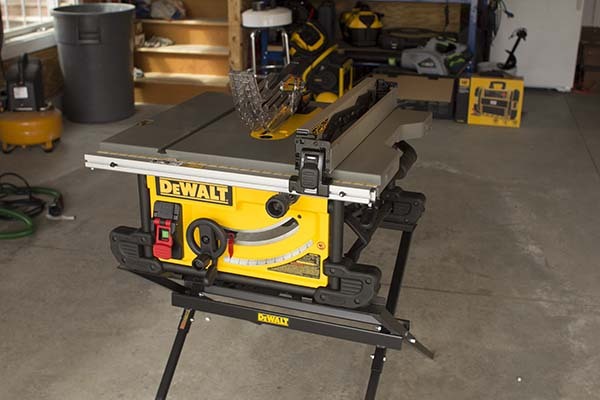 Find out what makes this job site table saw so special here. Dimensions: 26.5 x 25.8 x 17.5 inches; Weighs: 67.2lbs; Power: 15 AMP; Top speed: 4800 RPM. 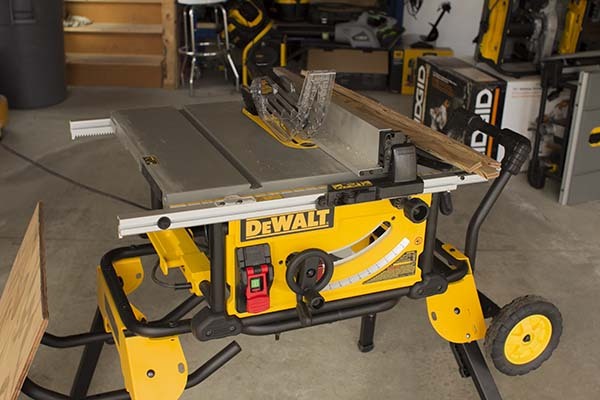 This portable table saw from Dewalt features rack and pinion telescoping fence rails which will enable you to make fast, smooth and accurate fence adjustments. The 24-1/2 inch of rip easily cuts a variety of larger shelving and trim materials. The Site-Pro Modular Guarding System allows for tool free adjustments of the guarding components, appropriate for each application. The durable 15 Amp 4800 rpm motor quickly and easily rips through hardwoods. A 24-Tooth carbide blade enhances cut quality and prolongs blade life, and the Blade can be adjusted 0 - 45 degrees for bevel applications. This system uses 10" blades with a 5/8" arbor size. The adjustable rear feet are designed to level the saw on uneven work surfaces, and the table coating reduces friction for smoother cutting. Features a dust port that allows the use of a 2-1/2 inch vacuum hook up and minimizes cleanup work. The metal roll cage base offers greater durability than other plastic bases. This table saw features onboard storage that provides easy access to the Site-Pro Guarding components and to the push stick when not in use. 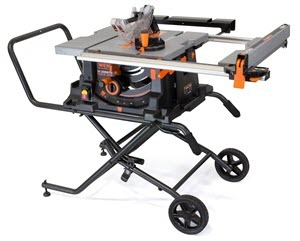 This unit also includes a DW7450 Table Saw Stand which features heavy-duty tube steel construction to maximize its durability and has integral support bar hardware holes which can be used to secure the saw to the stand. This stand folds flat for easy storage and transport. It comes with a miter gauge, a push stick, a 10” Carbide Blade, a Blade guard, and a Hardware bag. Portable Table Saw: What Does It Do? It cuts wood. Sounds pretty dull, doesn’t it? Not so much if you think that no other tool can cut more accurately than a table saw. Be it furniture, decorative elements or wood inlay you’re building, the versatile table saw is the right partner to choose for the job. Good woodwork comes down to being able to cut and join pieces of wood together. The joining part is most dependent on the accuracy of the cutting, and no machine beats the table saw when it comes to it. With a portable table saw you get not only accuracy but also the ability to change the location of your workspace according to your preferences. How To Use A Portable Table Saw? When working with any circular saw, you’re in fact working with a high-speed rotating blade - so, safety is key. First, use safety accessories such as gloves, a noise-canceling headset, a mask, and goggles. They will require some extra investment, but hey, it’s your health and well-being we’re talking about. Don’t rely on your experience or what other people say - take responsibility for your safety. Secondly, learning how to use the table saw properly will make for a well and, most importantly, safely done job. Take the time to read the instructions manual and do your research before you start cutting; if you’re a beginner, maybe you should consider attending a basic carpentry course first. Make sure that the rip fence is perfectly parallel to the blade when you lock it down. Otherwise, the wood board could either pinch the blade or shift away from it. Use the adjustment system on your portable table saw to make sure it’s in the correct position. Most saws will have extra protection around the blade - be extremely careful when handling it. You will sometimes have to remove the blade guard, but keep in mind to never change the position of the splitter or riving knife. The splitter and riving knife’s purpose is to keep the wood piece from rotating behind the blade and kicking back towards you, so besides supporting the cutting board, they’re also meant for protection. Before you go and make any cuts, make sure that the blade is square to the table. Use a carpenter square for that, and keep in mind that it should touch the side of the blade and not its teeth. Another piece of safety equipment is the push stick. A lot of portable table saws have it included in the package (see pick 1, 2, 4 and 6 on our list above). You can also make your own out of plywood - an L-shaped board which you hold by the longer side, while the shorter end (the part at the bottom of the L) is used to fix the cutting piece. The quality of the board you’re using is also important. It needs to be flat and have at least one straight edge, so it doesn’t rock on the saw table. You might also want to consider setting up an extra table alongside your saw table for the cut parts to be stored (number 5 on our list includes table saw extension boards for this very reason). Let’s see how the two main types of cuts are done. A rip cut is done along with the grain of the wood - along with the width of the board. To start cutting, set the fence. Then, adjust the height of the blade so that its teeth are just above the cutting board. Also, keep the board flat against the table and pressed against the fence; guide it with both your hands, but when the end starts getting close to the blade, finish the cut using the push stick to avoid getting your fingers too close to the blade. The splitter will come in and keep the board on track while you finish the cut. A crosscut is done, as the name suggests, across the grain of the wood, cutting from its length. To do a cross cut, you will need a miter gauge. One of these is included with every table saw, and it’s meant for angled miter cuts. However, it’s most often kept at 90 degrees. To make the best of the included miter gauge that came with your saw, you can add a homemade fence to improve coverage of length and width. Just screw in a piece of plywood. To make an accurate crosscut, take that carpenter square out again and make sure the gauge is square to the blade (side, not teeth). You won’t need the rip fence for this, so it’s best to get it out of your way. The only fence that will help you make a good crosscut is an auxiliary fence you add to the miter gauge yourself. By the way, the first cut will also cut through that - not all the way through, but enough to leave a mark which may be useful when moving on to the next cut. It will also help push the cut piece away safely and support the wood at the end of the cut, where it usually chips out. To cut more pieces of the same length, use a stop lock and clamp to keep them in place. These are the two main and most common cuts you can do with a portable table saw. How To Choose A Portable Table Saw? To choose the right portable table saw for your shop, consider the type of woodworking you do, the amount of time you spend woodworking, your budget and, in part, the access your shop allows in terms of working as well as storage space. Think power source - the saws we presented in part 1 of this article are supported by any ordinary power outlet but make sure that your shop has it, and that it can provide the power resources needed by the saw alongside other tools you will plug in. If you’re a DYier or carpentry aficionado and only spend a few hours a week in your shop doing small craft projects, you won’t need a very powerful or large, for that matter, saw. 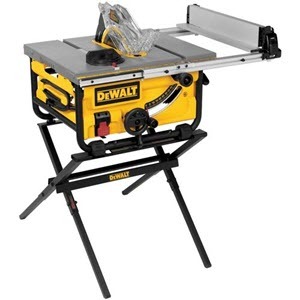 Our choice would be number 6: DEWALT DWE7480XA 10-Inch Compact Job Site Table Saw as it’s small enough without cutting on rotational speed- 4800 RPM. On the other hand, if you’re a professional and need a saw for production that you can run for long hours, you will probably need to consider something bigger and faster. 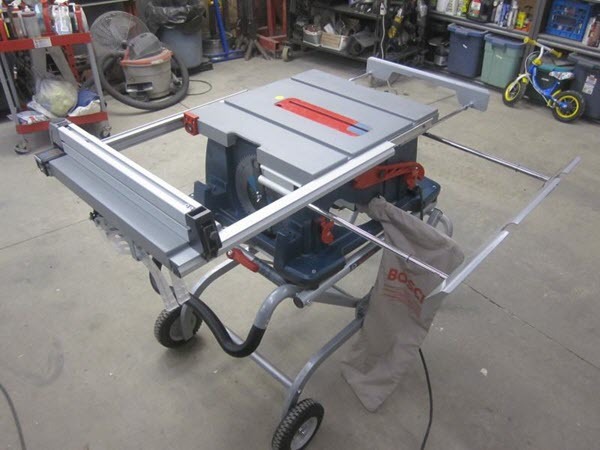 We recommend number 3 on the list for this purpose i.e., Bosch 4100-09 10-Inch Worksite Table Saw. To achieve the best results in your projects and keep your work safe, you must be able to use the table saw easily. Make sure that the saw is easy to calibrate, and the saw is easily adjustable so that you can replace the blade with minimum effort. If you’ve got a bad back, even rolling a heavy table saw around can be a tough task. We have no recommendations since everyone is different and experience varies from person to person, other than making sure that you can use the portable table saw. Easiness is the name of the game. Both the riving knife and the splitter protect the back of the saw blade from catching debris and throwing it back at you. The riving knife moves up and down with the blade, while the splitter doesn’t. Because it is not adjustable, the splitter is often removed from the saw. Thus, the former is less likely to be permanently removed from the saw, unlike the latter, which you may need to take out from time to time. This may represent a safety hazard and it has to do with the width of the board you’re cutting. So, if you will cut small pieces of wood, a splitter will suffice. While if you’re planning for a wider variety of cuts, look into a table saw that comes with a riving knife. As a best practice, this is the preferred option. 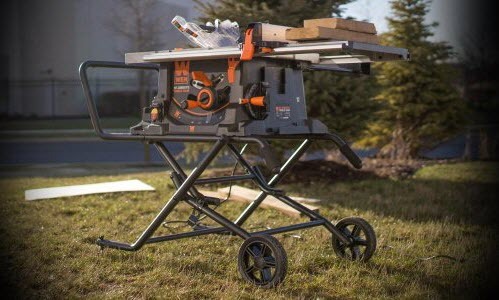 The best portable saw under this category are: Ridgid R4516 10 inch Portable Jobsite Table Saw, Bosch 4100-09 10-Inch Worksite Table Saw and DEWALT DWE7491RS 10-Inch Jobsite Table Saw. Cleaning up is the tedious part of any craftsman’s activity, so keeping everything tidy in your workshop while you work is important. On a more serious note, sawdust can and will be inhaled unless you wear a mask, so it’s best to look for a portable table saw with a dust collection system. It does not entirely keep debris away, but it can improve air quality. You just need to make sure you empty the bag from time to time to keep it from overflowing. 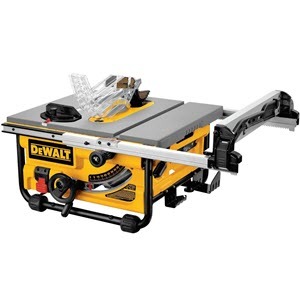 The best portable table saws under this category are: Bosch 4100-09 10-Inch Worksite Table Saw and DEWALT DWE7491RS 10-Inch Jobsite Table Saw. Last, but not least, consider your budget. Portability is not a cheap benefit; it’s on the compromise end of the table saw differential spectrum. Can you afford the portable table saw that fits your needs? If you’re okay with just basic features, your wallet may not lose as much weight as it would if you went for a more complex model. 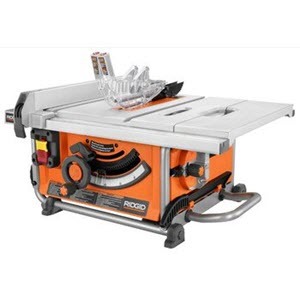 Best portable saw tables for the money are entries 1 and two on the list above: Ridgid R4516 15-Amp 10 inch Compact Table Saw and DEWALT DW745 10-Inch Compact Job-Site Table Saw. Finally, don’t forget that the best choice is an informed one. We hope you’ve found our recommendations and tips useful and we strongly encourage you not to stop here. Read everything you can about portable table saws, particularly user reviews, ask questions about everything you want to know to your peers and others more experienced than yourself- all these factors will combine like puzzle pieces into the perfect buying guide. Be sensible in your decision and avoid the hassle which being unsatisfied with your tool will throw your way. Make sure that you can easily return the package, just in case. Imagine you had to return something that weighs at least 40 lbs while being forced to postpone your crafting plans. Nail your woodworking projects by finding not the right portable table saw, but the one that is right for you!